I adore the super cute "Gnome Sweet Gnome" stamp set by Lawn Fawn that came with this month's kit. For this week's Wild Card Wednesday I wanted to make a CAS (clean and simple) card. 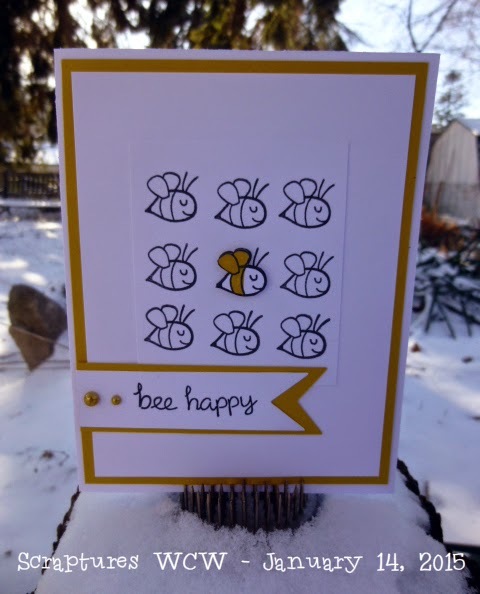 I stamped 9 bees on cardstock + an extra one which I coloured and popped up. Add some layers of cardstock, a sentiment and some bling...easy peasy lemon squeezy your CAS card is all done. Fabulous CAS card. Love it. those bees are so cute. Great job!!! Really simple cars but look so cute.